All You Coffee Drinkers, Pay Attention! Tip of the day: For all you coffee drinkers, pay attention! Big thanks to Judith Regan for having me on “The Judith Regan Show” on Stars Sirius/XM this past Saturday. I was speaking about the Alkaline Diet, and no doubt, the conversation went into the topic of coffee. Now, coffee is a sensitive subject for MANY people, sometimes like talking politics. But here are the facts – no matter what you have heard, coffee is ACIDIC with a pH of 5, which makes it 100x more acidic than pure water. Another fact – it is a liver suppressor. Whether you choose to have coffee or not is entirely up to you. Remember, life is about choices, and it should not be about deprivation, but rather, moderation. So, if you are going to have your coffee, the good news is there are some things you can do to make the acidic effects it has on your body less harmful. 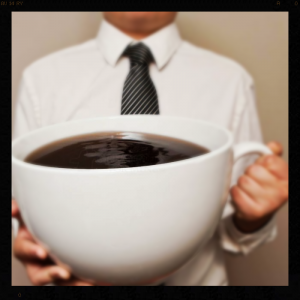 Most people get into trouble not so much with the coffee itself, but the SIZE of the coffee, the number of cups, and most importantly, what they add to it (sugar, sugar, and more sugar, dairy which clogs and inflames your digestive system!). Instead, add 1 tbsp. of cold pressed coconut oil to you coffee. This will help neutralize the acid in your coffee, and will make you coffee taste even better. Instead of milk, choose coconut or almond milk as a healthy alternative. Skip the sugar or sugar substitutes. Before you have your cup of coffee, commit to drinking a large glass of purified water, or even better, a large glass of water with ¼ to ½ squeezed lemon in it. How do you choose to start your day? SUPERHYDRATE! It’s a fact, that 75% of Americans are chronically dehydrated (caffeine and tea will both dehydrate you), and a 5% drop in body fluids will cause a 25-30% reduction in your energy – THAT’S CRAZY, HELLOOO – This is something you need to pay attention to! Anytime you wake up tired, the first thing you should do is hydrate, and I don’t mean coffee J Think progress, not perfection. Do your best to get ½ of your daily body weight in ounces of clean, purified water (i.e. 150 lbs should shoot for 75 oz of water, or 2-3 liters). Again, to supercharge your water, you can add a squeeze of lemon and/or lime to it which has a very alkalizing effect on your body.